Crepes do not contain either baking powder or bicarb of soda. Crepes also have a high liquid-to-flour ratio which enables the crepe batter to flow in a thin layer over the surface of the pan when cooking. A crepe batter also needs to be rested before use. As well as eggs (generally; but there are alternatives) and an acidifier, pancake batter may also contain a little bicarb of soda and has a lower liquid-to-flour ratio than crepe batter. Pancake batter does not need to be rested before use and, therefore, can be used immediately. I think of pancake batter as a ‘cake mix’, the bicarb of soda gives the pancake some rise. When compared to either crepe or pancake batters, waffle batter contains a higher percentage of fat (e.g. butter) and sugar. These higher levels of fat and sugar help the batter to brown and crisp when cooking. 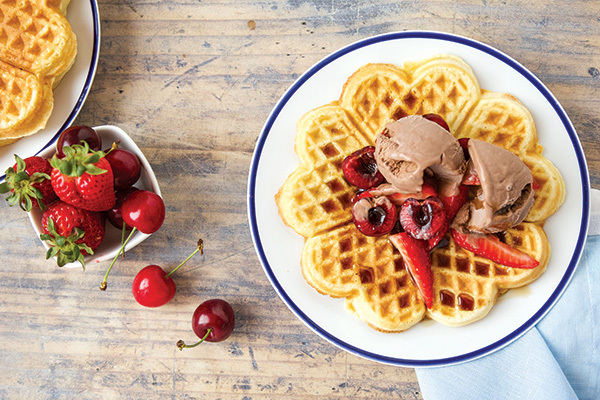 Thus, waffles lean towards a dessert concept. Handy Hint 1: You could make a richer version of this crepe recipe by adding an additional two egg yolks to the basic batter. 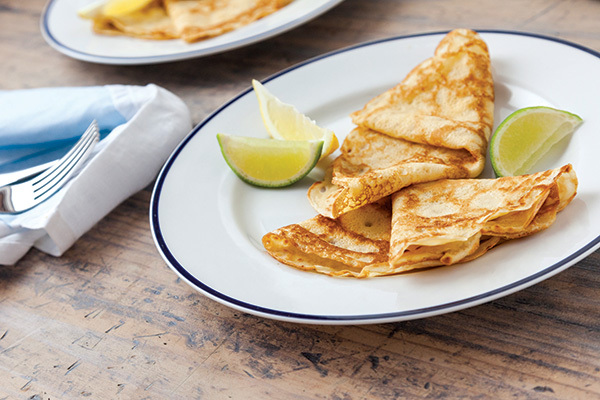 Handy Hint 2: Add either orange or lemon zest to the basic crepe batter for a zingy flavour boost. Handy Hint 3: You could substitute wholemeal flour for the plain white flour in this recipe. In a medium bowl, beat together the eggs and milk with a whisk. Sift the flour and salt together and add them to the egg/milk mixture in the bowl. Add the melted butter (or vegetable oil) to the egg/milk/flour mixture and beat together thoroughly. At this stage of the recipe, you may like to strain the batter to remove any lumps. Allow the batter to stand for at least an hour before making the crepes. Lightly spray a crepe pan or frypan with some non-stick cooking spray. Then warm the pan over a medium heat. Next, pour a couple of tablespoons of the crepe batter into the centre of the pan (depending on the size of your pan you may need a little/less batter). Tip the pan in all directions, rotating it slightly, to spread the batter evenly over the surface of the pan. Cook the crepe until the upper surface of the crepe appears dry. Quickly turn the crepe over and also cook it on the other side for about 30 seconds. Place the cooked crepe onto a plate and repeat the process with the remaining crepe batter. Crepes are excellent served individually rolled or folded, with a light sprinkling of sugar and a spritz of either lemon or lime juice. Handy Hint 1: Substitute wholemeal flour for white flour in the ingredients. 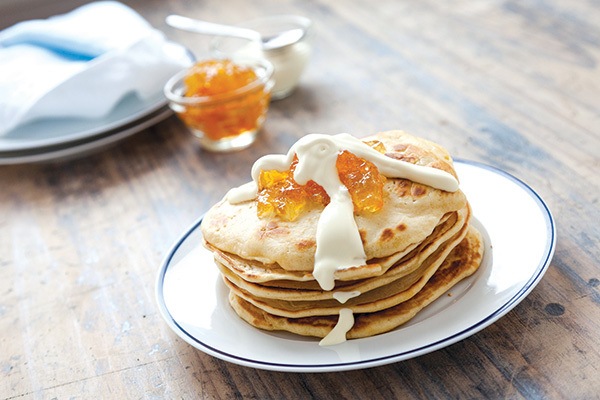 Handy Hint 2: You could substitute buttermilk for the milk in the pancake recipe. It is easy to make your own version of buttermilk by adding either a teaspoon of lemon juice or vinegar to a cup of milk. Sift together the plain flour, salt and bicarb of soda into a mixing bowl. In a second bowl, beat the eggs and milk together thoroughly. Then pour the egg and milk mixture into the bowl with the flour mixture. Mix together well. Now add either the melted butter or vegetable oil and beat thoroughly. Heat a heavy-based frypan over a medium heat. Lightly spray the pan with some non-stick cooking spray. Spoon tablespoons of the pancake batter into the hot pan, allowing sufficient ‘flipping over of the pancakes’ space between the tablespoons of batter. Cook the pancakes until bubbles appear on the surface and then flip them over to cook on the other side. When cooked, remove the pancake from the pan and place on a serving plate. Repeat the cooking pancakes process until all of your batter is used. Pancake, jam and cream… Sounds good around about now, doesn’t it? They can be presented as a stack, if you like. Handy Hint 1: For a richer batter, halve the quantity of milk and make up the quantity with cream. Handy Hint 2: Add some shredded (fresh) coconut to the basic batter. Handy Hint 3: Add some chopped strawberries to the basic batter. Sift the plain flour, bicarb of soda, sugar and salt together into a bowl. Beat the egg yolks in another bowl until they are pale yellow. Then add the beaten egg yolks to the milk and beat well. Pour the egg yolk mixture into the bowl with the flour mixture and blend thoroughly. Add the melted butter to the bowl and stir together well. Allow this mixture to stand for an hour. This is to keep the air in the mixture. At the end of the hour resting time, beat the egg whites in a clean bowl until they are stiff. Then gently fold the egg whites into the rested batter. Please don’t stir, but turn and fold the mixture. Heat the waffle iron (either stove top or electric) and then spray the inner surfaces with a non-stick cooking spray. Fill the waffle iron two-thirds full with some of the waffle batter. Cook until steam stops coming out the sides of the iron. If you are using a stove top waffle iron, you will need to turn it over during this time so that both sides cook. After cooking to a golden brown, carefully lift the upper lid on the waffle iron and turn the waffle onto a plate. Repeat the waffle cooking process with the remaining waffle batter. Plop a good amount of ice-cream (and/or fruit) on top of your waffle, add your favourite sweet sauce/topping, and enjoy. The full feature appeared in Caravan World #559. Subscribe today for the latest caravan reviews and news every month!